Additionally, the Group has its own insurance operation which is organized in a separate Captive, Finse Forsikring AS. As part of the Norwegian railway reform (jernbanereformen), the Group’s passenger transport sales and ticketing function, rolling stock, train maintenance operation, and real estate business were demerged. The demergers were carried out in line with the concept pooling of interests and with financial reporting effect from 1st of January 2017. The demergers have resulted in a reduction in equity of 5,442 MNOK, which is specified in the statement of changes in equity. The effect of net group contributions and related tax effects are included in the equity reduction from the demerger. In the 2016 financial statement, the demerged entities were classified as discontinued operations in the income statement, and assets / liabilities held for distribution in the statement of financial position. Accounting principles that affect the comparative figures for the demerged real estate business are presented in a separate section below. All NSB AS shares are owned by the Norwegian Ministry of Transport and Communication. The NSB-Group’s main offices are located in Oslo. The financial statements 2017 were approved by the Board of Directors on the 9th of February 2018. All numbers in the report are in MNOK, unless otherwise stated. The consolidated financial statements have been prepared in accordance with International Financial Reporting Standards (IFRS) and IFRIC interpretations as approved by the EU. Significant accounting principles used in the preparation of the Group financial statements are described below. These principles are used consistently for all presented periods, unless otherwise stated. The consolidated financial statements have been prepared under the historical cost convention with the exception of financial derivatives, certain financial assets and financial liabilities and investment property which are valued at fair value. The Group adopts the going concern basis in preparing its consolidated financial statements. Application of the Group accounting principles implies that the management must exercise judgment through use of estimates and assumptions. Estimates and assumptions are continuously evaluated and are based on experience combined with expectations of future events that are probable at the time of evaluation. The Group continues to evaluate expected useful life and expected residual value on fixed assets to determine annual depreciation. The Group reviews its fixed assets values and the need for write downs. These reviews require considerable judgment. See the note on fixed assets for a description of impairment tests and related sensitivity analysis. The Group conducts tests annually to evaluate provisions for contract losses based on indications of impairment. For property, plant and equipment an impairment test is performed first. Then the present value of future cash flow for each separate contract is measured. These evaluations involve a large degree of judgment. We refer to the note on Provisions for a more detailed description. The Group has considerable liabilities related to employees’ pension rights in defined pension benefit plans. Calculations are based on economic and demographic assumptions. Changes to assumptions can considerably affect the calculated liabilities of future retirement benefit expenses. For more information on pensions and a more detailed description on the assumptions used, see the retirement benefit obligation note to the financial statements. Included in the note is a sensitivity analysis that illustrates how sensitive the calculations are to changes in key assumptions. Actuarial deviations related to such changes are included in other comprehensive income with a direct effect to equity, after deducting deferred tax. Parts of the Groups’ revenue come from a fare cooperation with other transport operators. These revenues are accrued on the number of travels, composition of ticket types and historical data. These evaluations entail a significant degree of judgment and use of estimates. The Group has significant provisions for restructuring costs as a result of the railway reform. The use of best estimates is exercised when calculating the basis of provisions. Please refer to notes on provisions for restructuring costs for further details. The Group prepares an ongoing provision for accrued costs for periodic maintenance in accordance with the obligation in the lease agreement. This is based on estimated cost per kilometer driven, the Group’s route and, maintenance plan and regulation in the lease agreement. These assessments involve the use of judgment and estimates. Please see note for periodic maintenance for further details. The Group financial statements show the total financial result and the total financial position for the parent company and its subsidiaries. Subsidiaries are companies where the Group exercises control. Control occurs when the Group, as an investor, has the ability to influence variable yield that the Group has a right to or is exposed to. Subsidiaries are consolidated from the time the Group obtain control, and are excluded from consolidation when control ceases to exist. Transactions with non-controlling owners in subsidiaries are treated as equity transactions. Joint ventures are companies or entities where NSB has joint control with one or several other investors. The Group has considerable shares in single purpose companies for development of real estate projects that are considered to be joint venture. Share of associates are companies where NSB has considerable, but not controlling influence. Normally, considerable influence is defined as having an ownership between 20 % and 50 % of the voting rights. Ownership in both joint ventures and associates are accounted for using the equity method of accounting. The acquisition method of accounting applies to business combinations. Compensation is measured at fair value on the transaction date which is when risk and control is transferred and will normally coincide with the implementation date. An allocation of the acquisition price is based on fair value of assets and liabilities acquired. Additional value that cannot be allocated to identifiable assets and liabilities are allocated to goodwill. If fair value of identifiable assets and liabilities is higher than consideration given, the excess is charged to income. The principles on how to recognize acquisition of associates and joint ventures are the same as for acquisition of subsidiaries. 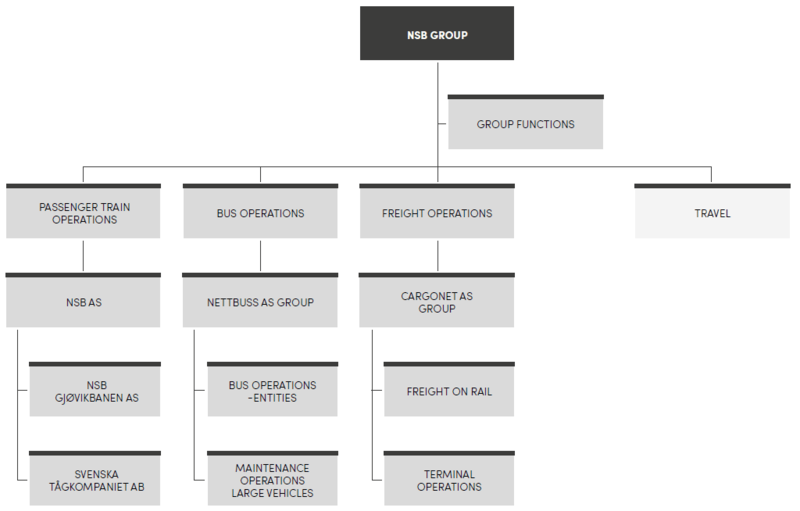 NSB reports its operating segments according to how Group management, which is the operating decision-maker, adopt, follow-up and evaluates decisions. The NSB-Group financial statements are presented in Norwegian kroner and all numbers are in MNOK, which is both the functional currency and presentation currency for the parent company. The NSB-Group operates mainly in Norway, as well as some in Sweden. Income statements and balance sheets from Group entities with a functional currency different from the presentation currency are converted accruing currency translation differences directly to equity through other comprehensive income. Operating income and –expenses, purchases as well as financing expenses are mainly in the following currencies: NOK, SEK, DKK, CHF and EUR. Transactions in foreign currency are re-calculated to the functional currency at the transaction date. Foreign exchange gains and losses from such transactions and from the translation of foreign currencies are recognised in the income statement. Public grants are systematically recognized in the income statement in the accounting periods the company include the expenses that the grants are meant to compensate. Public grants that are related to assets are accounted for net, through the grant being treated as a reduction of the amount included on the balance sheet. The Group’s revenues come mainly from sale of passenger- and freight transport services. Sale of services, including public purchase of passenger traffic services, is included in the accounting period the services are delivered. Dividends received from companies other than subsidiaries, associates and joint ventures are recognized on the date when the decision was made by the distributing company. Property, plant and equipment (PPE) and operating related property is shown at cost less subsequent depreciation. Cost includes expenditure which is directly attributable to the acquisition of the items such that it’s ready for use. Subsequent costs are included in the asset’s carrying amount when it is probable that future economic benefits will flow to the Group and the cost of the item can be measured reliably. All other repairs and maintenance are charged to the income statement during the financial period in which they are incurred. Borrowing costs accrued during construction of PPE, are capitalized until the asset is ready for intended use. Land and residential buildings are not depreciated. The fixed assets’ residual values and useful lives are reviewed, and adjusted if appropriate, at each balance sheet date. Gains and losses on disposals are included in the income statement and are determined by the difference between the sales price and the balance sheet value. Operations and non-current assets are classified as held for sale or held for distribution if the sale or distribution in its present condition is considered highly probable with implementation during a fiscal year. Non-current assets classified as held for sale or distribution at the lower of its carrying amount and fair value less costs to sell. When an entity is classified as held for distribution the income statement would show the Group’s profit as if the entity had been distributed at the start of the period. The figures for discontinued operations does not show what these entities would have had of revenues and expenses if they had been independent entities, but it shows the impact the distribution has on continued operations of the Group. See note 2 – Continued and discontinued operations for more information regarding the principles in the preparation of the Group’s continuing operations, in addition to income statement and statement for financial position for continuing and discontinued operations. The Group’s property portfolio consists of operating related property (IAS 16), investment property (IAS 40) and development property (IAS 2). The Group’s properties are mainly owned by ROM Eiendom, which will be demerged from the Group and is therefore classified as held for distribution as of 31 December 2016. There is a close and compound relation between operating property (IAS 16) and investment property (IAS 40) with several combined properties. For combined buildings that may be sectioned for sale, each separate section and part of the property is evaluated separately. Areas that change character from operating property or development property to investment property or the other way around must be reclassified. Reclassification will occur at the moment when there is a changed purpose and use of the actual property on a permanent basis. Property used within the Group’s operations are considered as operating related property in accordance with IAS 16 and are treated in compliance with PPE as described above. Investment property consists of property (land, building or both) that are owned for the purpose to achieve a long-term yield from rental income, increase in fair value or both. Property that the Group leases out to the external market on commercial terms and long-term basis, are classified as investment property and are considered in accordance with IAS 40. First time measurement at cost and inclusion of costs on the balance sheet complies with the principles for PPE and operating related property as described above. Further measurement of investment property is at fair value. Fair value corresponds with estimated market value used in a possible sales transaction between two independent parties. The values are estimated using external appraisers at each balance sheet date. The fair value determination is based on each separate property expected discounted future cash flow with individual risk adjusted yield. Value changes due to changes in market value of investment property are continuously charged to the income statement and are presented on a separate line in the operating profit. Value changes due to reclassifications from developmental property are charged to the income statement. Value changes due to reclassification from operating related property are charged to other comprehensive income. Property where the intention is to develop and then sell is categorized as development property (IAS 2), even if the properties are temporarily leased on short-term agreements. Developmental property for sale is valued at the lower of acquisition cost and net realizable value in accordance with IAS 2. Acquisition cost consists of purchase price for properties, as well as project related expenses to develop each property. Project related expenses mainly include expenses up until it is regulated and made ready for sale including salaries, external consultants, etc. Incurred borrowing costs that are directly related to the development of the property are capitalized in accordance with IAS 23. Net realizable value is estimated selling price less costs related to the completion. The portfolio of developmental property available for sale is separated and is followed up as separate projects. The separation is based on the separate property’s geographical location. Intangible assets as well as property, plant and equipment that depreciate are considered for impairment when there are indications that future earnings cannot justify balance sheet value. Goodwill and intangible assets with indefinite useful life are not subject to depreciation, but are tested annually for impairment. Impairment is recognized if the carrying amount is higher than the recoverable amount. The recoverable amount is the higher of fair value less selling costs and value in use. For the purposes of assessing impairment, assets are grouped at the lowest levels for which there are separately identifiable cash flows (cash-generating units). At each reporting date, one considers the possibilities for a reversal of prior impairments (except goodwill). The Group’s activity results in entering into long-term public contracts for delivery of public transportation. For several of the contracts, the Group assumes part of the risk for the development in several cost areas (for example salaries, interest and fuel) without any income adjustment. This could result in contract losses if future remaining costs are higher than estimated revenues. Before a provision is performed for contracts that may result in losses according to IAS 37, an evaluation is completed in accordance with IAS 36 (see section for impairment above). Then the Group measures continuously the present value of future expected cash flow from operational activities in each separate contract, where estimated payments consists of all future unavoidable operating costs including wear on assets. The provision is limited to the lower of continuing the contract or to go out of the contract. The provision is reversed over the remaining life of the contract. The Group uses swaps to secure interest rates and currency on long-term debt to ensure predictability, and to hedge energy prices to obtain the lowest possible price and predictability in prices. The Group does not use hedge accounting. Derivative financial instruments are recognised at fair value on the date a derivative contract is entered into and are subsequently measured at fair value. Changes in fair value on derivative contracts entered into as debt instruments are included in net financial income, while derivative contracts related to electric power are included as other operating expenses. A financial asset is classified as held for trading purposes if its primary reason for acquiring is to result in gains due to short-term changes in fair value. Fair value of listed investments is based on its last registered value. If the market for the security is not active or if it concerns a security that is not listed, the Group uses evaluation methods to determine fair value. Inventory is valued at the lower of acquisition cost and net realizable value. Acquisition cost is calculated using the average price method. The cost of finished goods and work in progress comprises of design costs, raw materials, direct labour, other direct costs and related production overheads (based on normal operating capacity). Incurred borrowing costs that are directly related to the acquisition or manufacture of the goods, is included in the cost price of the goods. Net realizable value is the estimated selling price in the ordinary course of business, less applicable variable selling expenses. Receivables include trade receivables and are initially measured at original value which is also considered to be fair value. For subsequent measurement receivables are considered at amortised cost using the effective interest method, less provisions for probable losses. A provision for impairment of trade receivables is established when there is objective evidence that the Group will not be able to collect all amounts due according to the original terms of the receivables. Cash and bank deposits including restricted tax withholdings and restricted bank deposits in Finse Forsikring are specified in note 18. If bank overdrafts are utilized, it will be included in borrowings under current liabilities. The initial recognition for loans is fair value adjusted for directly related transaction costs. In the following accounting periods, the loans are, as a rule, measured at amortized cost using the effective interest method such that the effective interest is equal throughout the life of the loan. The Group has several bonds that have associated interest- and currency swaps. Where measurement and reporting at fair value show more relevant information because inconsistent measurement of loans and associated interest swap is eliminated, or to a certain degree reduced, this principle is used in the financial statements. Choice of principle is made at the time of each separate loan raised and is binding throughout the term of the loan. Income tax expense for a period consists of tax payable and deferred tax. Deferred income tax is calculated on all temporary differences between tax- and book values as well as tax effect of net losses carry forwards. Deferred income tax is determined using tax rates and tax laws that apply on the balance sheet date. Deferred tax asset that are expected to be utilized are included on the balance sheet. Deferred income tax asset and liability are offset when there is a legally enforceable right to offset, and it is related to income taxes levied by the same taxation authority for (i) the same taxable entity or (ii) for separate taxable entities where the intention is to settle taxable positions on a net basis. The companies in the Group operate various pension schemes; both defined benefit plans and defined contribution plans. Defined benefit pension plans are schemes where the employer commits to periodical pension benefits to the employee when he/she retires. The pension payment will mainly depend on number of years in the plan, compensation level at retirement age and the size of the benefits from the national insurance scheme. The liability recognized on the balance sheet is the present value of the defined benefit pension plan at the balance sheet date, less the fair value of plan assets at the balance sheet date. The defined pension liability is calculated annually by an independent actuary using the projected unit credit method. The cost of pension contributions and net interest rate on the defined benefit pension plan obligation is included in net income. Changes to the pension plan benefits (plan changes) are expensed or recognized as income continuously in the income statement. Actuarial deviations that are caused by new information and changes to the actuarial assumptions are included instantly, through other comprehensive income. Defined contribution plans are pension plans under which the employer pays contributions towards the employees’ future pension without further obligations after the contribution is paid. The payments are included in the income statement as payroll and related expense. Provisions for environmental restoration, restructuring costs and legal claims are recognised when: the Group has a present legal or constructive obligation as a result of past events; it is more likely than not that an outflow of resources will be required to settle the obligation; and the amount has been reliably estimated. Restructuring provisions comprise of costs when withdrawing Early Retirement Pension Regulated by Contract (AFP) beyond normal expectations, severance pay and associated termination and liquidation costs. Provisions are not recognized for ongoing operations nor future operating losses. Where there are a number of similar obligations, the likelihood that an outflow will be required in settlement is determined by considering the class of obligations as a whole. Provisions are measured at the present value of the expected expenditure required to settle the present obligation. The discount rate used to determine the present value reflects current market assessments of the time value of money and the increases specific to the liability. The increase in the provision due to passage of time is recognized as interest expense. Other short-term debts include trade payable and are initially measured at original value which is also considered to be fair value. At later measurement dates, trade receivables will be considered at amortized cost by using the effective interest method. Leases where the lessor retains substantially all the risks and rewards of ownership are classified as operating leases. Payments made under operating leases are charged to the income statement on a straight-line basis over the period of the lease. Leases where the Group mainly has all the risk and return are classified as financial lease. When entering an agreement, the financial lease is included on the balance sheet at the lower of the assets fair value and current value of future lease value. The lease payments are divided between liabilities and financial items. Property, plant and equipment are depreciated using the linear method. The dividend distribution to the company’s shareholders is recognised as a liability in the Group’s financial statements when the dividend is approved by the General Assembly. Fair value is measured using quoted prices from active markets for identical assets and obligations. Fair value is decided by using input based on other observable factors; either direct (price) or indirect (derived from prices) rather than noted prices (used in level 1) for the asset or obligation. Fair value is measured using inputs that are not based on observable market data. Financial assets and obligations were classified in level 1, 2 or 3. The company’s investment property is classified in level 3. Revenue from lease of real property was accrued over the length of the lease agreement. Revenue from sale of property was recognized in the period where risk and control were transferred to the buyer. As a main rule this means that the revenue was recognized on the acquisition date. It was the building’s character and buyer’s ability to influence the final project that determined whether revenue recognition was conducted according to IAS 11 construction contracts or IAS 18 revenue. For property constructed where the purchaser had significantly influenced outcome, an expected gain, according to IAS 11, were included according to the rate of completion. The Group’s property portfolio consisted of operating related property (IAS 16), investment property (IAS 40) and development property (IAS 2). The Group’s properties were mainly owned by ROM Eiendom, which was demerged from the Group and therefore were classified as held for distribution as of 31st of December 2016. There was a close and compound relation between operating property (IAS 16) and investment property (IAS 40) with several combined properties. section and part of the property was evaluated separately. with PPE as described above. increase in fair value or both. Property that the Group leases out to the external market on commercial terms and long-term basis, are classified as investment property and are considered in accordance with IAS 40. First time measurement at cost and inclusion of costs on the balance sheet complied with the principles for PPE and operating related property as described above. Further measurement of investment property was at fair value. Fair value corresponds with estimated market value used in a possible sales transaction between two independent parties. The values were estimated using external appraisers at each balance sheet date. The fair value determination was based on each separate property expected discounted future cash flow with individual risk adjusted yield. Value changes due to changes in market value of investment property were continuously charged to the income statement and were presented on a separate line in the operating profit. Value changes due to reclassification from developmental property were charged to the income statement. Value changes due to reclassification from operating related property were charged to other comprehensive income. Property where the intention was to develop and then sell were categorized as development property (IAS 2), even if the properties were temporarily leased on short-term agreements. cost and net realizable value in accordance with IAS 2. Acquisition cost consisted of purchase price for properties, as well as project related expenses to develop each property. Project related expenses mainly included expenses up until it was regulated and made ready for sale including salaries, external consultants, etc. Incurred borrowing costs that were directly related to the development of the property were capitalized in accordance with IAS 23. Net realizable value was estimated selling price less costs related to the completion. the separate property’s geographical location. The Group has not implemented any new accounting standards nor made changes to accounting principles in 201t. The Group has elected not to early adopt any standards nor interpretations that have an adoption date after the reporting period. Below is an overview of the most central Standards that have been adopted by the IASB. replace the parts of IAS 39 which describes accounting, classification and measurement of financial assets and liabilities, hedge accounting, measurement at amortized cost and impairment of financial assets. The standard is not considered to lead to significant changes regarding the classification or valuation of financial assets or liabilities, nor is the new model for impairment testing of assets. The standard has a mandatory effective date of 1st of January 2018, and is to be implemented retrospectively. The Group has chosen the option of implementation without conversion of comparative figures. In the spring of 2014, the IASB adopted a new standard for revenue recognition. The standard establishes a framework for recognition and measurement of revenue based on a fundamental principle that recognition of revenue reflects the transfer of ownership of goods and services to the customer. The group’s revenue streams mainly relate to passenger and goods transport where no significant differences have been identified between today’s principles for recognition and framework in a new standard. It is therefore not considered that the standard will cause any significant differences compared with current principles. The standard takes mandatory effect on 1st of January 2018. The Group will implement the standard using a modified method that does not involve conversion of comparative figures. IASB adopted in the beginning of 2016 a new standard for leasing. The general rule of the new standard is that the lessee must recognize all leases in the statement of financial position. According to IFRS 16, all significant leases with a lease term over one year must be recognized. asset” for the use of the underlying asset over the lease term. Under IFRS 16, there will no longer be a distinction between financial and operating leases for the lessee. The NSB Group has a significant number of leases relating to premises, and train and bus equipment. With the exception of bus rental, the leases are classified as operating leases according to the current lease agreement (IAS17). The Group has decided to implement IFRS 16 from the financial year 2018, and will in the implementation use a modified retrospective method without recalculation of comparative figures. The implementation effect is taken against the opening balance on 1st of January 2018, by recognition of the value of the assets (right-of-use) equal to the equivalent value of the lease obligations. When calculating the “right-of-use asset” and the corresponding obligation, the present lease agreements are used as base case. The perating agreements included in the business usually include an option for one of the parties to the agreement. In estimating the length of the discounting period, the Group’s best estimate of the duration of the lease agreement has been taken into account. Implementation of the standard is considered to result in a significantly increased total balance due to the recognition of future lease bligations, which at the time of implementation is matched by a “Right to Use Asset”. This is estimated to an amount of 7,400 MNOK which represents the present value of future lease payments. The discount rate that has been used is corresponding to the interest rate in the lease agreement, and in the absence of this, the Group has used an estimated market-based borrowing rate for the relevant company, asset and duration. The implementation on the 1st of January 2018 decreases the equity ratio of the parent company NSB AS to 29.2% (42.7%) before recognition of dividend for the 2017 income year. For the NSB Group, the equity ratio decreases to 26.5% (34.3%) before recognition of dividend for the 2017 income year. In the income statement, the change will provide a reclassification between operating costs and financial expenses. The total cost of the use / rental period will be equivalent to the current standard. At the beginning of the period, the cost of the period will be higher than towards the end of the period. This is due to linear depreciation and reduced interest expenses over time. For 2018, this is estimated to reduce operating expenses by pproximately MNOK 170 (reduced rental costs by MNOK 1,600 and increased depreciation by 1430) and increased financial expenses of around 265 MNOK. Net effect in the income statement for 2018 is an increased cost of 95 MNOK related to leasing. IFRS 17 is adopted by the IASB in 2017 and replaces IFRS 4 Insurance Contracts. IFRS 17 states principles for recognition, measurement, presentation and disclosure of insurance contracts. The new standard is not considered to be of importance to the Group’s operations. The standard takes mandatory effect on 1st of January 2021. IASB has also adopted several small changes and clarifications in several different standards where the changes have not yet been implemented. It is not expected that any of these changes will have considerable effect for the Group. The demerger was completed pursuant to the accounting pooling of interest method with accounting effect 1st of January 2017. The demerger has resulted in a reduced equity of NOK 5,442 MNOK, which is specified in the statement of changes in equity. The effects of net group contributions paid to demerged entities, including corresponding tax effects are included in the equity effects from the demerger. In the annual statement for 2016, the demerged entities were classified as discontinued operations in the Income statement, and assets and liabilities held for distributions in the Overview of financial position. Please find further details below. The income statement and financial position of continuing operations have been prepared based on total operations, less income, expenses and financials position from discontinued operations. Previously intercompany income and expenses between continuing and discontinued operations are included as external income and expense. Best estimates are exercised when allocating expenses between continuing and discontinued operations. The Annual Report thus expresses that discontinued operations has been separated at the beginning of 2016. Moreover, figures for 2015 are restated to provide comparative information. On 15th of October two important key operations were separated and transferred to newly founded and wholly owned subsidiaries to prepare organizational changes adapted to the railway reform. The operations associated with sales- and ticketing system was transferred to Entur AS. Trains and staff who works with acquisition and leasing of equipment in NSB was transferred to Materiellselskapet AS. The entities were an integral part of the parent company prior to the structural change. External funding relating to trains was transferred to Materiellselskapet AS in a subsequent process. Expenses, including financial expenses and depreciation related to these entities are allocated to discontinued operations. Similarly, these costs are reallocated to operating expenses for continuing operations as they will be charged in the form of lease of trains, and sales- and ticketing services. The profit from discontinued operations includes the consolidated effect of the remaining NSB Group, and not the profit these entities would have achieved if they had been separated from the Group during the period. The comparative figures have been restated by adding a profit of MNOK 60 to operating expenses. Trade and other receivables from continuing operations in NSB AS will increase compared to trade and other receivables in NSB Group for total operations due to a receivable of 5 671 MNOK in continuing operations towards discontinued operations as of 31st of December 2016. 1Remaining shares are owned by CargoNet AS. The Equity presented, is 100 % of the equity recognized in the subsidiary’s statement of financial position as of 31st of December 2017. NSB AS, NSB Gjøvikbanen AS, Svenska Tågkompaniet AB and NSB Anbud AS are included in Passenger rail operations. The bus segment consists of the Nettbuss-Group operations. TThe freight traffic segment consists of the CargoNet-Group operations. Travel is not yet presented as a separate segment. The segment assets in the tables below consist mainly of property, plant and equipment, intangible assets, inventories and other assets and cash, while deferred tax asset and investments are not included. The Group mainly operates in Norway. The Group also has some operations in Sweden. The Group has one customer that constitutes more than 10 % of operating income. The Government’s purchase from the NSB-Group is included in note 33. Goodwill is exclusively in the Nettbuss Group. There is no goodwill impairment in 2016, nor 2017. Goodwill is annually tested for impairment by comparing the carrying amount with the recoverable amount. The ratio is monitored based on what is considered as the natural cash-generating unit (CGU) associated with each acquisition. There are as of 31th December 2017, goodwill recorded on several CGUs in the Bus-business segment, and all these CGUs are followed up locally in the wholly owned corporate group Nettbuss. The recoverable amount is calculated based on the value the asset will add to its CGU. Liquidity prognosis’ based on approved budgets are approved by leadership for the next five year period. The cash flows from the tender period are limited to the end of the agreement-/tender period. For the commercial agreements, the cash flows after the first five years utilize the estimated growth rates presented below. 1 Weighted average growth used to derive cash flows past the budgeting period. 2 Interest rate before tax used to discount the cash flows. These assumptions have been used for the analysis of each cash-generating unit within the business segment. Management determines budgeted net cash flows based on the past performance and its expectations of market development. The weighted average growth rate used is consistent with the forecasts included in industry reports. The discount rates used are pre-tax and reflects specific risks relating to the relevant segments. The recoverable amounts from the CGU based on usage value are higher than the balance sheet values. Assuming other assumptions remain constant, the sensitivity calculations regarding an increase in the interest level of 2 % of the goodwill amount on the balance sheet will decrease by MNOK 6. As a train lessee, the Group is under the lease agreement responsible for carrying out heavy maintenance. Provisions for maintenance costs are continuously recorded on the basis of estimated costs per kilometer driven, and the route- and maintenance plan. Costs are estimated based on existing maintenance contracts, and historic maintenance work. Actual incurred maintenance costs are offset against the provision. Upon return of the leased equipment, the Group will have to compensate, or will be entitled to a compensation from the lessor, based on the equipment’s maintenance level, assessed at the end of the lease period. The assessment involves use of judgment and estimates. Investments in associates at 31st of December 2017 include goodwill of 0 MNOK (0 MNOK). The group’s share of 25% of Oslo S Parkering AS was sold on December 7, 2017. In connection with the sale, the Group reconized a gain of 133 MNOK, which is included in the share of profit from associates in 2017. Share of profit and loss includes adjustments from prior years. The amounts below show the Group’s share of assets and liabilities as well as revenue and expenses in joint ventures. * Applies to both continuing and discontinuing operations. For 19 years, Flåm Utvikling has operated the travel product Flåmsbana with NSB AS as a supplier of train transport services. Flåm Utvikling conducts product development, sales, marketing, customer relationship management and brand development of Flåmsbana, as well as the foundation for commercial year-round operations of Flåmsbana. Flåmsbana is the country’s first year-round mountain/fjord railway destination. * Applies to continuing operations. For details of non-continuing operations that were demerged as part of the railway reform in 2017, please see Note 2 for comparative figures. The carrying amounts of the trade receivables, prepayments and other receivables approximate their fair value. Trade receivables include mainly freight revenue, rental revenue and non-calculated public purchase amounts due from counties. security, spread of risk and liquidity, NSB should maximize the return of the managed capital. The Group invests portions of the surplus liquidity in interest-bearing products such as bank deposits, certificates, bonds with short remaining maturity and interest rate funds. The Group’s activities result in various types of financial risk: market risk (foreign exchange-, interest rate-, and price risk), credit risk and liquidity risk. The Group’s risk management policy focuses on the capital markets unpredictability and strives to minimize the potential negative effects on the Group’s financial results. The Group uses financial derivatives to hedge certain risks. Risk management is carried out by a centralized Group treasury department. Group treasury identifies, evaluates, and hedges financial risk in co-operation with the Group’s operating units. Currency risk is the risk that fluctuations in the exchange rate will lead to changes in the Group’s income statement, statement of financial position or cash flows. The Group operates in the Nordic region, makes purchases from foreign suppliers and is therefore exposed to currency risks. The Group minimizes currency risk associated with larger investments from foreign suppliers by mainly entering into agreements in NOK. The goal is to create predictability with respect to future payments measured in NOK. Any debt in foreign currency will be hedged through foreign exchange swaps and changes in value are offset by fair value changes in the derivatives. The Group is therefore not exposed to currency risk on debt instruments. The Group has certain investments in foreign subsidiaries, whose net assets are exposed to currency risk. This risk is not considered to be of significant importance to the Group. Interest rate risk is the risk that a fair value of a financial instrument or future cash flows will fluctuate due to changes in market interest rates. The Group’s securities in the interest rate market are exposed to changes in market rates. As the investments have a short average interest rate duration, value changes are moderate. The Group is exposed to changes in interest rates, and uses interest rate swaps to reduce interest rate risk and to achieve its preferred duration on its debt portfolio. The goal is to reduce risk related to possible future interest rate increases, and create more predictability as to the future interest payments. Guidelines have been established to regulate the share of loans that is subject to interest rate changes within a twelve month time period, and for the interest rate duration of the portfolio. Any swaps entered into create risk of changes to booked fair value when measuring against interest level as at the date of the statement of financial position. Interest rate risk is calculated using the Group’s long-term loans with corresponding interest rate swaps. By changing the rate by 50 basis points, interest rate risk results in a calculated risk of fair value change of 0 MNOK (2016: 27 MNOK). The Groups last bond issue was repaid in November 2017. In 2017, excess liquidity was significantly higher than in previous years. The excess liquidity was invested in the Norwegian money market and was therefore exposed to changes in Norwegian money market rates. The management of excess liquidity has a short average interest duration and therefore the fair value changes due to changes in money market rates are moderate. In addition, risk will largely be exposed by the fact that investments in interest-bearing securities are held to maturity. The Group has a risk associated with price changes related to electric power and diesel used in its train and bus operations. The Group are only in a limited extent hedging its future electricity and diesel needs. Liquidity risk is the potential inability to meet short term liabilities. NSB’s management monitors the Group liquidity reserve (consists of borrowing facilities and cash equivalents) through rolling forecasts based on the Group’s expected cash flow. NSB reduces liquidity risk on maturity of financial obligations by accessing a number of financing sources in Norway and internationally, as well as maintaining adequate liquidity to cover planned operating-, investing-, and refinancing needs without assuming new debt due within 12 months. Liquidity consists of bank deposits, interest rate certificates, money market funds, overdraft accounts and a committed revolving credit facility on 2,000 MNOK which expires in April 2019. NSB has a high credit rating. Standard & Poor’s rates NSB’s long-term debt at A- (negative outlook). This high credit rating gives NSB good access to external financing. Credit risk is the potential loss if an external part cannot meet its financial obligations to NSB. The Group’s exposure to credit risk is mainly related to individual customers. Passenger train- and bus operations mainly sell its services on a cash basis. Deferral of payment is given to public authorities based on long-term agreements. Revenue from freight operations is divided between several medium sized customers whose financial development is tracked through updated credit assessments. Other subsidiaries have its parent company as their main customer. The Group is therefore to a small degree exposed to credit risk. NSB is exposed to credit risk through placement of excess liquidity with issuers of debt securities. The parent company has established limits for credit exposure against sectors and individual counterparties based on credit assessments. NSB has risk against its counterparties in interest- and currency derivative agreements. NSB focuses on counterparty risk in its financial transactions. The credit risk (counterparty risk) is reduced by diversifying exposure across several counterparties. Strict requirements are set for the counterparty’s creditworthiness with a minimum A- rating from S & P, or equivalent from another international rating agency upon conclusion of the agreement. Counterparty risk is continuously monitored. NSB AS has agreements that regulate judicial offset calculations in a bankruptcy situation (ISDA agreements) with several banks. Excess liquidity is placed in Norwegian certificates and bonds with short-term remaining maturity, as well as Norwegian money market funds. Guidelines are established for credit exposure against several sectors, and specific issuers based on credit assessments. For the wholly owned subsidiary, Finse Forsikring AS, the Board of Directors has approved extended limits on placement of surplus liquidity. The company has made investments in four listed mutual funds on the Oslo Exchange; “Skagen Global”,” Nordea Stabile Aksjer Global Etisk” and ”Storebrand Global Multifactor”. A decline in value of 41 % gives a calculated portfolio risk of 25 MNOK (2016: 39 % -21 MNOK). The evaluation and determination of percentage decline in value has been set in accordance with the Financial Supervisory Authority of Norway’s regulations on reporting stress tests for insurance and pension companies. The Group does not use hedge accounting. Fair value changes in derivatives are continuous recognized in the income statement. Derivatives are classified as current assets or contractual obligations. Energy contracts relate to hedging of electricity and diesel prices. The notional principal of the outstanding interest rate swaps contracts at 31st of December 2017 was 13 MNOK (2016*: 3,180 MNOK). At 31st of December 2017, the fixed interest rate was 5,25 % (2016*: 3.97 % to 4.13 %) and the floating rates are mainly 6M NIBOR + margin. Fair value is based on changes in original interest rate, currency exchange and spread (at recording time) against market interest rate, and currency exchange rates at the reporting date. Effective interest rate on short term placements of financial instruments was 1.20 % at 31st of December 2017 (2016: 1.5 % ) and the placements has an average maturity of 93 days. Effective interest rate on short term bank deposits was 1.05 % as at 31st of December 2017 (2016: 2.5 %). Includes restricted funds of 128 MNOK (2016: 132 MNOK). There is only one class of shares. The par value of a share is NOK 1,000,-. As a result of demerger, the share premium reserve was reduced. There was no dividend payment for the fiscal year 2016. A 315 MNOK dividend has been proposed for 2017. The decision will be made at the General Assembly in 2018. The Group has not utilized its bank overdraft facilities. All existing bond issues have been completed under the Euro Medium Term Note loan programme (EMTN-Programme). The EMTN programme is a loan-documentation that NSB utilizes when bonds are issued. The EMTN-programme does not contain any financial covenants, except for an optional clause that requires that the State of Norway shall own 100 % of NSB. NSB has a multicurrency revolving credit facility of 2,000 MNOK with a covenant that demands a minimum equity share of 20 %. Fair value of the credit margin on bonds is based on market observations from banks and the price/exchange in the second-hand market. The carrying amounts of the non-current debt approximate their fair value. The facility that expire within one year is a bank overdraft related to NSB-Group bank account system. Credit is granted for one year at the time and is renewed annually. NSB’s long term revolving credit facility expires in April 2019. In addition, NSB has entered an agreement to lease trains from 2016 to 2021. The rent amounts to 1,212 MNOK for 2018. Tax payable in the balance sheet will partly be offset by proposed group contributions which will be decided by the general assembly in 2018. Deferred tax assets on forwarded fiscal losses are recognized when it is probable that the Group will utilize the losses towards future taxable profits. The Group has not recognize deferred income tax assets in Sweden of 64 MNOK (64 MNOK) in respect of losses carried forward amounting to 290 MNOK (291 MNOK). Average full-time equivalent and number of employees apply to the total operation in 2017 and 2016. The calculation is based on a weighted average of the actual full-time equivalent for the year. The Group has pension arrangements related to age-disability- and bereaved benefits for spouses and children. Below is a more detailed description of type of arrangements and how these are structured. The companies in the Group have several collective pension agreements that are handled by the Norwegian Public Service Pension Fund (SPK) or insurance companies. The Norwegian companies comply with the law on public pension. The plan covers benefits from the pension basis up to 12G and results in a age- and disablity pension of 66 % of the pension basis when fully vested. The obligations connected to these agreements covers 3,708 active members and 3,769 retirees. The retirement benefit plans entitle defined future services that mainly are dependent on the number of contribution years and wage level at the time of retirement. The pension benefits received are coordinated with the National Insurance scheme and will also be dependent on its benefits paid out. The companies have, through tariff agreements, retirement benefit obligations in affiliation with Early Retirement Pension Regulated by Contract (AFP). Obligations through this agreement cover 3,708 active members. The additional defined benefit pension plan agreement for top leadership is not funded and will be paid through operations. A decision was made end of December 2017 to settle the current pension benefit plan for NSB AS and NSB Gjøvikbanen AS in the Norwegian Public Service Fund (SPK) for those above 55 years old by the end of 2018. All younger employees will be granted an earned right in the SPK, and will join a new defined contribution plan as of 2019. The SPK expects employer’s final settlement to employees to be available in the 4th quarter of 2019. The Group’s 2017 pension cost and 31st of December 2017 pension liability is calculated according to IAS 19. The carrying value of the pension liability in these companies amounts to 1,574 MNOK, and is considered to give a fair, and as of the balance sheet date, best view of the Group’s liability taking into account the estimated effect from the pension plans settlement. Agreed compensation to employees for whom the defined benefit pension plan settlement will have a negative effect, is expensed with 78 MNOK. The Norwegian state amended the criteria on who should pay the accrued regulation liability for the SPK defined benefit plans from 1st of January 2018. The amendment to the payable regulation liability is not included in NSB AS pension liability as it is primarily financed by grants from the Norwegian state in the revised national budget for 2017. There are additionally defined contribution plans in Norway which covers 5,167 employees (5,243 employees). All of the Groups’ employees in Sweden have pension rights and the companies’ obligations are funded in a Multiemployer plan that covers 1,615 employees (1,519 employees). The plan is a Multiemployer plan and the employer is responsible for the benefits until payments are made in full. According to the statement from Redovisningsrådet, this is a performance based settlement. It has so far not been possible to obtain sufficient information to calculate and allocate obligations and assets for this plan, and therefore it is treated as a defined contribution plan. The companies have not received actuary estimates for any of the fiscal years from 2007 until today. This is an issue faced by most companies with a retirement benefit obligation with the Multiemployer plan in Sweden. In the tables below, employment taxes (notional numbers) are included for both gross obligations and this year’s expense. The table below shows estimates for potential effects with change in assumptions that significantly affects the defined benefit pension plans in Norway. Actual results may substantially differ from these estimates. The Population is characterized by a high pensioner population and high average age on participants that affects the sensitivity analysis. The discount rate is set at 2.5 % ( 2.6 %) and is determined based on preferential bonds (OMF). The OMF-market is considered a deep and liquid marked with applicable terms to maturity that qualifies as a reference for interest rate according to IAS 19. Salary adjustments for Norwegian schemes is primarily calculated as the total of expected real salary growth of 1 % and inflation of 1.5 %. Pension adjustments disbursement primarily follows average salary growth (equivalent to G regulation) less a fixed factor of 0.75 %. On the demographic factors, the tariffs K2013 and IR 73 has been used for determination of mortality rate and disability risk. Actuarial deviations in 2017 are mainly due to changes in economic parameters as well as the effect of increased regulatory responsibility in the Norwegian Public Service Pension Fund. The Group has assumed an obligation to pay pension to the employees for as long as they live. An increase in life expectancy among members results in an increased obligation for the Group. The Group is affected by a reduction in actual yield on the pension assets, which will cause an increase to the Group’s obligations. The Group’s pension obligation is exposed to both inflation and salary changes, even though salary development changes are closely related to inflation. Higher inflation and salary changes than used in the pension calculations, increases the Group’s obligations. The amount due to related parties is in 2017: 51 MNOK (18 MNOK). Book value of trade and other payables corresponds to fair value. Other current liabilities include pre-paid revenue, accrued payroll and related expenses as well as other accrued expenses. In establishing NSB AS, the company was obligated to refund employees who were made redundant before 1st of January 2005. NSB was compensated with a limited calculated amount, which is included as a reorganization obligation in other long-term debt on the balance sheet. Compensation for work related injuries which occurred during the period from 1st of January 1990, until the formation of NSB BA 1st of December 1996 are covered by the company. Accruals are made for expected outcomes of existing cases and expected future cases. The NSB-Group is involved in legal disputes, with some being tried in the courts. Accruals are made for disputes where there is a probable and quantifiable risk of losing. NSB Group announced a restructuring plan in 2016. The purpose of the restructuring is to adapt to the changes required by the railway reform (see Note 2). For an overview of the total restructuring costs please refer to note 36. The restructuring provision of 275 MNOK at the end of 2017 is mainly due to the downsizing that will incur in 2018, as well as approved compensation in the revised pension scheme as of 31 December 2018. For provisions on losses on tenders in the bus operation, see note 28 for further information. Operating revenue in the Group is mainly related to long term tender contracts which means significant investments in property, plant and equipment (PPE). In the presentation of the accounts as at 31st of December 2017 an evaluation of the value of the Groups’ PPE is performed, where there are indications of permanent impairment (IAS 36). To test the balance sheet value, calculations using value in use have been performed. Value in use is calculated for every cash flow generating unit (CGU). Calculation of value in use has been performed on the tenders where there is an indication of permanent impairment on PPE. The value in use is calculated as present value of expected future cash flows for each tender. Revenue from the contracts and expected operating expenses, including overhead that can be allocated to each separate CGU, are included in the contracts’ lifespan in the future cash flows. At the end of the contract, a repurchase value on the buses is included, based on experiences or residual value guarantees from suppliers. Included in the contracts, the contracting entity has the option to extend the contracts. In the evaluations of the contracts, it is assumed that these options are exercised and included in the cash flows. Impairments are undertaken if the balance sheet value is lower than the recoverable amount. The recoverable amount is the higher of fair value less sales costs and value in use. In addition to evaluating balance sheet values according to IAS 36, the contracts are also evaluated for any additional provisions according to IAS 37. In these evaluations the Group measures continuously present value of future expected cash flows from operational activities in each separate contract, where estimated payments include all future unavoidable operating expenses. The provision is limited to the lower amount of continuing or exiting the contract. The provision is released over the remaining life of the contract. Based on the main assumptions, the Group has not recognized or reversed impairment losses in 2017. The Group has cash-generating units where the assets are valued at value in use as at 31 December 2017 and are written down by MNOK 23 (MNOK 35). The Group also has cash-generating units where the assets are valued at the fair value of buses as at 31 December 2017, which are written down by MNOK 3 (MNOK 11). For contracts where the assets are written down to fair value, total value in use is MNOK 103, which was approximately MNOK 1 lower than fair value. To describe the uncertainty that are included in the IAS 36 impairment calculations, sensitivity analysis on selected variables in the calculation have been performed. A sensitivity analysis is performed on contracts where PPE is impaired in the current year. A change in discount rate of +/- 1 % -points affects changes to present value differently across contracts. The overview below shows the effects a discountrate change has on the contracts with a need for impairment of property, plant and equipment. * Actual accumulated impairment affected by evaluations of market value of buses. The cash-generating units rated at fair value for buses would be classified at Level 2 in a valuation hierarchy. The assets that are valued at use value would be classified at Level 3 in a valuation hierarchy. As the owner of NSB, the Ministry of Transport and Communication is a related party. In addition, other businesses owned by the Ministry of Transport and Communication is also a related party to NSB. All subsidiaries, associates and joint ventures as noted in notes 3, 10 and 11, as well as other Group companies that are related parties to these companies, is a related party to NSB. Executive management and the Board of Directors are also related party to NSB. There are no related party loans. NSB AS has issued a guarantee of 40 MSEK on behalf of its fully owned subsidiary Svenska Tågkompaniet AB for a license to operate trains in Värmland in Sweden. NSB AS has issued a guarantee of 150 MSEK on behalf of its fully owned subsidiary Svenska Tågkompaniet AB related to a contract with Norrtåg AB. All employees are included in the collective pension agreement. The agreement premium is not included above. For NSB AS, the General Meeting has approved a fee for the Chairman of the Board of 434.5 TNOK, Vice Chairman 263 TNOK and the other board members 216.5 TNOK each. In addition, fees for members of the audit committee with 66 TNOK for the leader, and 39.5 TNOK for each of the other members, and the compensation committee with 11.5 TNOK for the leader and 5 TNOK for each member. Fees for the staff representatives include their employee wages. * Calculated pension expenses for executives are related to pension arrangements in addition to collective arrangements, for further description see point d) in the text below. Some of the participants have been compensated for exiting the arrangements. These costs have earlier been accrued for in the Group. * Calculated pension expenses for executives are related to personal pension arrangements in addition to collective arrangements, for further description see point d) in the text below. The Group has an Executives Salary Declaration that provides guidelines for remuneration of senior executives. The principles in the declaration apply to executives as defined in the Public Limited Liability Companies Act and the Accounting Act. This means that they also applies to Group management in NSB. Guidelines and principles as expressed in this statement, are applied in setting executive salaries in Group subsidiaries. Principles for remuneration to senior executives in the NSB Group are determined by the Group Board and follow Guidelines for salaries and other remuneration of senior executives in enterprises and companies with state ownership interest determined by the Ministry of Industry and Fisheries with effect from 13th of February 2015. The Board annually evaluates the CEO’s salary and terms and the Group’s Executive Salary Declaration. The CEO determines the remuneration of the other members of the Group Management in accordance with the adopted salary wage principles. Executive compensation should be competitive, but NSB will not be a market leader in compensation when compared to equivalent companies. To ensure this, an annual external compensation evaluation on central executive positions is performed. NSB shall attract and keep skillful leaders. Total executive compensation in NSB shall reflect the level of responsibility, results and development, and take into consideration the size and complexity of the operation. The compensation must not take form or be at a level where it impairs the Groups’ reputation. Executive compensation can consist of fixed salary and additional compensation, including fringe benefits, bonus, severance and pension. The fixed salary shall always be the main part of the total compensation. The executive compensation scheme must be transparent, and in accordance with the principles of corporate governance, as well as the state guidelines for executive compensation. The compensation system should be perceived as understandable and acceptable both internally and externally. The compensation system should be adequately flexible so that adjustments can be made if needed. The total level of executive compensation is composed of fixed salary and other benefits. Below are the various elements that can be included in the executive salary compensation. The fixed salary is the main element in the compensation arrangement of the executives in NSB. The fixed salary will be competitive, but not market leading. The fixed salary is assessed once a year. At hiring of executives, the grandfather-principle should apply and be discussed among executives a level above before the candidate is given an offer. The CEO must consult the Chairman of the Board before hiring and setting executive salaries. No executives are compensated for Board participation within the NSB-Group. Executives are offered fringe benefits at comparable market rates. Examples are free phone, free internet service, car compensation and free newspapers. • The variable salary must be based on defined and measurable criteria. Several relevant criteria must be applied. • There must be a strong connection between the goals for the variable salary and the goals of the company. • The bonus criteria must be based on variables the executive can influence, either directly or through the group of executives he/she is part of. • The bonus arrangement must be transparent and simple to understand. • Sickness absence (in the calculation, this bonus criterion counts for 15%). The other members of the group management have bonus criteria based on the CEO’s criteria, but tailored to the individual’s area of responsibility. It is a precondition for bonus payout that the group collectively achieves a return on equity of at least 5 %. • Bonus targets must be established within each of the four strategic areas of the NSB Group’s strategy, including profitability requirements. – For the Group CEO and the four Executive Vice Presidents for Travel, Strategy and Mobility, Group Economics and Finance, and Organization and Staff, the Group’s overall results are used in calculating target achievement. – For the three CEOs of NSB Persontog, Nettbuss and CargoNet, the Group’s overall results and the company / business area’s own results count for 50% each in calculating the target achievement for this bonus component. • Bonus target related to the smart journey, the green journey and the safe journey make up 50% of the total bonus potential and counts for one third each, and is tailored each executive’s area of responsibility. Examples of bonus targets that can be included in these categories are efficiency measures (Kompass, Flyt), development of mobility solutions, travel, customer satisfaction, quality, climate gas emissions, reputation development, sickness absence, occupational injuries and accidents. When new executives are appointed, the above mentioned state’s guidelines with effect from 13th of February 2015 are followed. These guidelines state that the pension conditions for senior executives shall be in line with other employees’ terms. There are no former senior employees continues to earn occupational pensions after leaving the Group. All 2017 employees are members of a collective pension scheme. Following negotiations with the employees’ federation, the Group Board decided on the 19th of December 2017 to switch to a new pension scheme in NSB AS with effekt from year end 2018. This entails a liquidation of the current scheme in the SPK, and closure for employees over 55 year as of 31st of December 2018. Consequently, with effect from 1st of January 2019, the Group Management, except the CEO will be on a defined contribution plan with the same conditions as all other employees in NSB AS. This scheme has a 5.5 percent deposit rate up to 7.1G, and 15 percent between 7.1 and 12G. The pension scheme contains a private AFP and a group life insurance of 20G. The disability coverage is the same as in today’s sheeme in SPK. The CEO’s pensionable age is 67 years. He has a collective pension arrangement. The arrangement carries rights to a pension of maximum 12 G. On top of that, the CEO has a defined contribution plan of 30 % of the fixed salary over 12 G, entered into in 2011. NSB has historically entered into pension agreement, with executives, which entitles them to a 60 % pension compensation level of their pension earned from the age of 62. This operating pension arrangement was closed as of 1st of January 2008. There is currently no one in the management team in this scheme. The CEO has the right to 6 months of severance and benefits if leaving involuntarily. Any other salary in this severance period will reduce the severance compensation. For other senior executives an agreement can be reached for a reasonable severance pay which takes effect if the employee does not dispute the termination. The total salary including severance cannot exceed 12 months of fixed salary. Severance arrangements will not be utilized when the cessation of employment is voluntary. The executive compensation policy for 2017 has been completed in accordance with abovementioned guidelines. The CEOs fixed salary was adjusted by 2.4 % to 3,741,696 NOK. Received bonus was 892,185 NOK for results achieved in 2016. Four employment agreements were signed in 2017 with new members of the group management team. All these agreements are according to this declaration. There were no severance payments made during 2017 for executives that exceeded 12 month fixed salary. The principles and guidelines for salary and other benefits to executives also apply for the determination of executive salaries in group companies. All group companies have in 2017 followed these principles without exception. In 2016, the Group acquired 100% of the shares in Hallingdal Lastebilservice AS, LVD Lastvagndelar AS and Nettbuss Eigedom Sogndal AS. The group also acquired 49% of Nordvik Last og Buss AS with an option to purchase the remaining 51%. The option was exercised in January 2018 and from then on the company is a wholly owned subsidiary. The option price is shown in the table below as “Trade and other payables” of MNOK 9. Nordvik Last og Buss AS has been fully consolidated from the date of acquisition of 49%, as it was assumed that the Group controlled the company. Additionally, total restructuring costs for discontinued operations amounted to 218 MNOK in 2016.